Boris Ferapontoff came from a well-known, wealthy family in czarist Russia. Beginning in February 1920, he attended Ouspensky's lectures in Constantinople. Ferapontoff also attended Gurdjieff's lectures after he arrived in Constantinople that June. The lectures ended when both men left, Ouspensky for London, Gurdjieff for Germany, in August 1921. 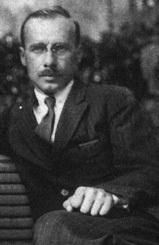 Ferapontoff joined Gurdjieff and other students in Berlin, later moving to the Prieuré. He died in Paris around 1930. Ferapontoff was Gurdjieff's secretary, and of all the Russian pupils the one most fluent in English.1 He was often the translator at Gurdjieff's lectures. He was also appointed as a movements instructor at the Prieuré. His notes from the Constantinople period are the only record of this period. They are a combination of what he heard from Ouspensky and Gurdjieff. Efforts will be made only when there is a need. The need will come only if a man understands that he knows nothing. He will understand only when he has material, and he will have material only after observation. Begin with what is beyond doubt. Where is the center of gravity? Where does motive come from? Once one has learned to fight against the momentum of the body, it will be easier to fight against other momentums. Consciousness is the work of three centers. No transition between waking state and self-consciousness. 1. J. G. Bennett, Gurdjieff: Making a New World (London: Turnstone Books, 1973), 239. 2. Ouspensky Papers, Sterling Library, Yale University.